I am super excited to finally post this! Over the past several months I have been working on developing a unique hot end design that I think will encourage significant innovation within RepRap. In short, the Prometheus Hot End is a customizable all-metal hot end that will allow users to configure the “melt-zone” length, “transition-zone” length, and thermistor position according to their needs. These parameters traditionally remain fixed in standard hot ends and allow for very little experimentation. My primary goal when designing the Prometheus Hot End was to provide RepRap users with an all-in-one flexible solution that would open up the possibility for experimentation with all of the significant hot end parameters that govern extrusion behavior. I think that this is the next step in hot end design and I believe that it will help us further our understanding of the intricacies of hot end science. I am posting this now because I want to start a discussion about the technical facets of this design along with the possible future implications. I really want to know what you guys think about this and get your opinion on the design decisions that I made. The discussions on the E3D Hot End thread are an incredible source of information so I hope I can add to that knowledge with this thread. Anyway, lots of interesting information and pictures below! As our community continues to explore new boundaries, exciting high-temperature plastics like Polycarbonate and Nylon are becoming widely available. 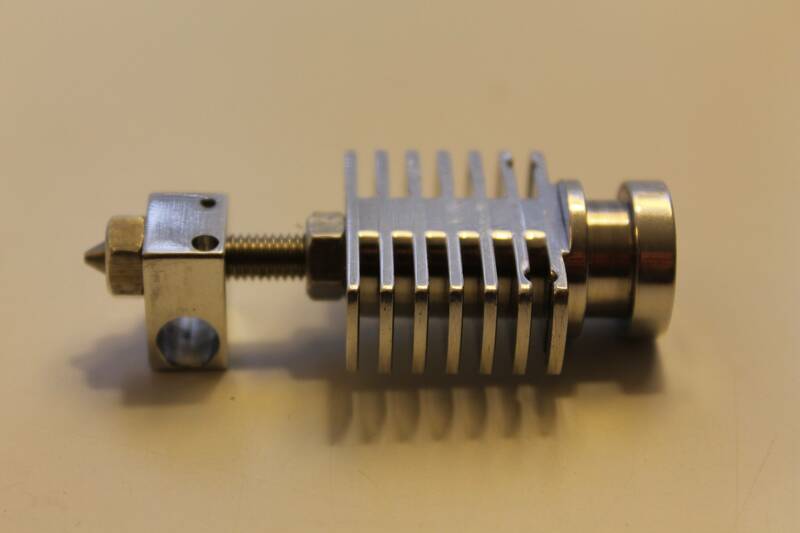 As a result, RepRappers are replacing their old PEEK insulated J-Heads with new all-metal hot ends that are capable of printing at these high-temperatures. 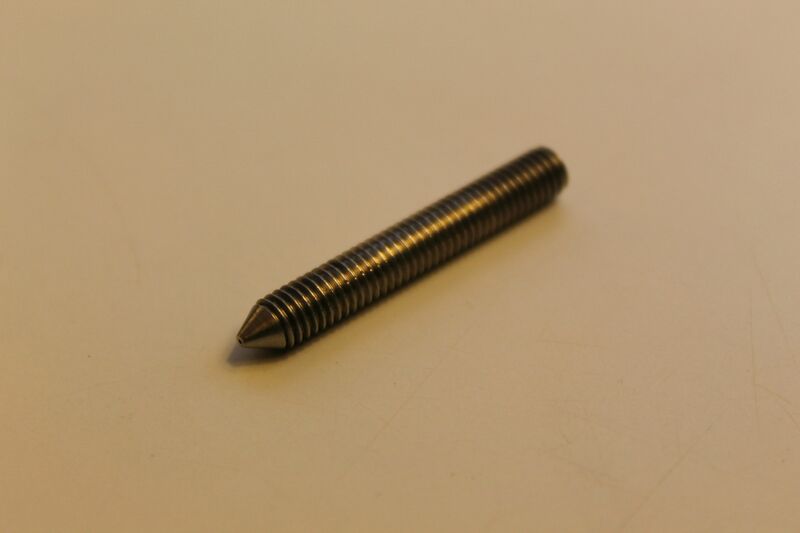 With a plethora of new hot end designs and the widespread success of the E3D hot end, all-metal hot ends are becoming the ubiquitous all-in-one solution for RepRap 3D printers around the world. Despite these recent innovations, I have noticed that the new all-metal hot ends have the same static design features of a fixed "melt-zone", "transition-zone", and thermistor position. While these new designs satisfy the need for reliable high-temperature extrusion, they seem to ignore the fact that users may require different hot end parameters for their specific needs or simply for experimentation. It didn't seem like anyone else had solved this problem yet so I decided that I would take on this project. Finally, after months of designing, three generations of prototypes, and hundreds of hours of printing, the Prometheus Hot End was born! This bleeding-edge hot end design allows RepRap developers to experiment with all aspects of thermoplastic extrusion. Its actively cooled all-metal construction is very durable and can easily withstand the high temperatures required for extruding thermoplastics like Nylon and Polycarbonate, while its unique modular design enables the user to customize the "melt-zone" length, “transition-zone" length, and thermistor position according to their needs. - Durable, actively cooled, all-metal construction for high-temperature extrusion up to 300C (limited by thermistor reading). - Modular design with user-variable "melt-zone" length, "transition-zone" length, and thermistor position for your specific need or experimentation. - Precision CNC-machined parts featuring an internally burnished 1-Piece Stainless Steel Nozzle. - 1-Piece Stainless Steel Nozzle eliminates all leaks and clogs caused by internal "melt-zone" junctions. - Compact design conserves z-height, weighs about 30g, and fits standard extruder bodies. - Printed successfully for hundreds of hours with PLA, ABS, PC, and Nylon 618. - Number of hot end leaks, clogs, and jams: 0 (zero!). 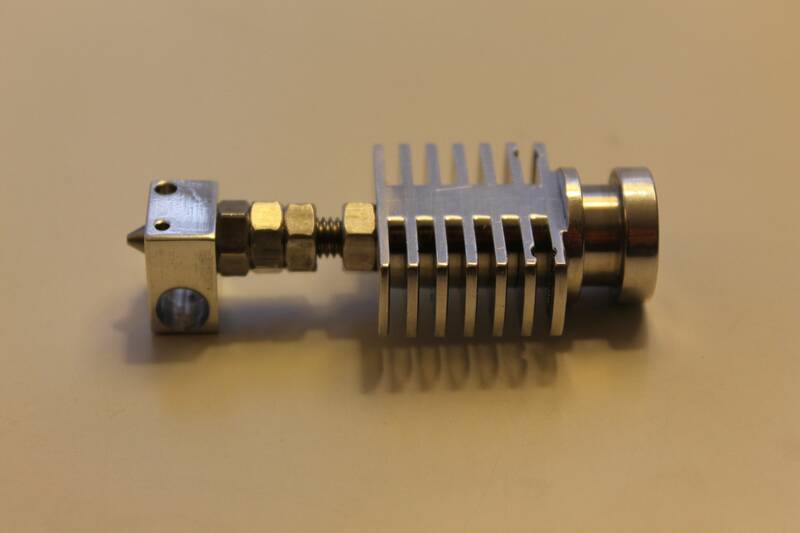 The modular design of the Prometheus Hot End consists of three custom designed and precision CNC-machined components: the Aluminium Heat Sink, the Aluminium Heater Block, and the 1-Piece Stainless Steel Nozzle. Every component of the Prometheus Hot End was carefully engineered for optimum performance. The Aluminium Heat Sink is precision CNC-machined and polished for a beautiful surface finish. Aluminium was chosen as the material for the heat sink due to its high thermal conductivity and high machinability. The heat sink incorporates a standard groove mount design for compatibility with standard extruder bodies. Fins are turned into the heat sink to maximize cooling and symmetrical faces are milled on each side to allow a 25mm cooling fan to be mounted directly to the heat sink. This design feature eliminates the plastic fan duct, decreases mass, and increases cooling efficiency. The heat sink is also threaded from top to bottom to allow the 1-Piece Stainless Steel Nozzle to be threaded into the heat sink and fastened at the bottom with an aluminium hex nut. 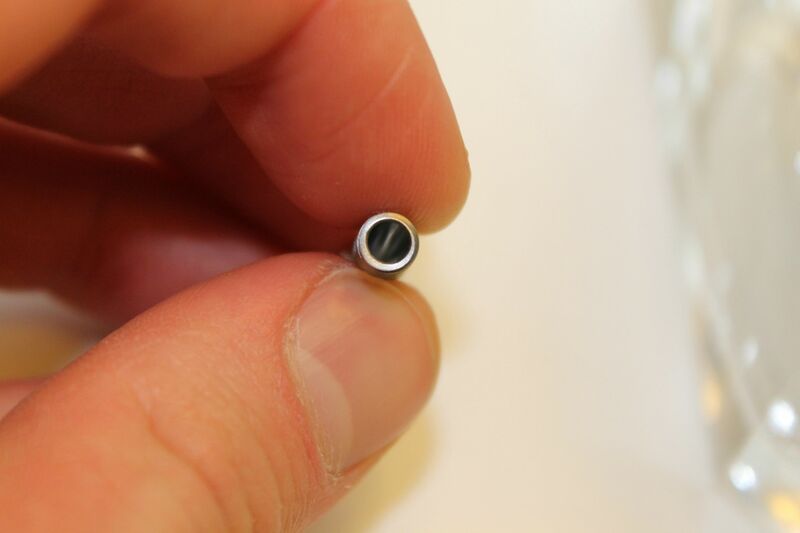 A PTFE tube is inserted from the top and meets with the nozzle in the threaded portion of the heat sink to facilitate a low friction filament path into the nozzle. *Note: This PTFE tube is inserted in the “cold-zone” of the hot end in the actively-cooled heat sink so it is NOT subjected to high temperatures. The Aluminium Heater Block is precision CNC-machined and polished for a beautiful surface finish. Aluminium was also chosen as the material for the heater block due to its high thermal conductivity and high machinability. 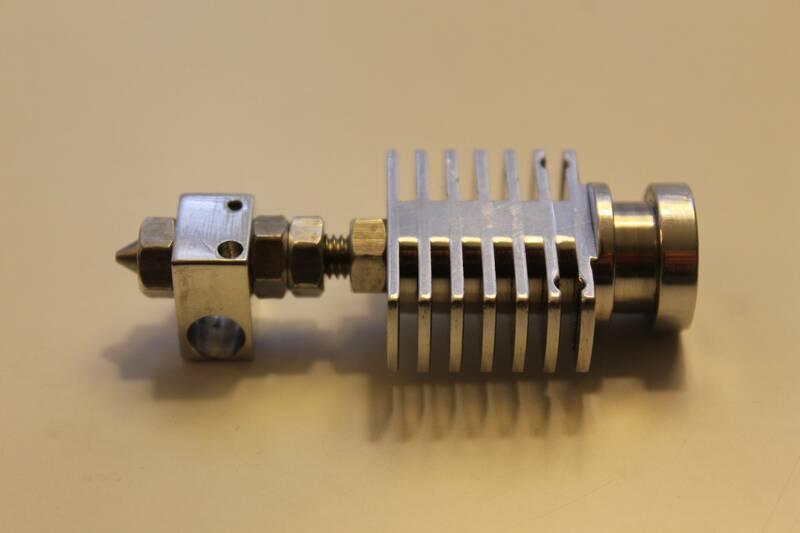 The Aluminium Heater Block is simply designed with a 6mm hole for the heater, two thermistor mounting holes, and a top-to-bottom threaded hole for the 1-Piece Stainless Steel Nozzle. The nozzle is threaded through the top and secured with an aluminium hex nut. Additional aluminium hex nuts can be used to customize the “melt-zone” length. The heater is a 12V 30W through-hole resistor heater and the thermistor is a Semitec 100K glass bead thermistor which measures up to 300C. The heater block features an additional thermistor hole which is useful if you want to use a slightly larger standard EPCOS thermistor. The 1-Piece Stainless Steel Nozzle is precision CNC-machined and polished for a beautiful surface finish. Stainless Steel was chosen as the material for the 1-piece nozzle due to its low thermal conductivity, low thermal expansion, and high strength. This design replaces the standard nozzle and heat break combination in most all-metal hot end designs with a 1-piece nozzle that eliminates all internal "melt-zone" junctions. Internal "melt-zone" junctions are the leading cause of leaks and clogs in conventional hot end designs. Molten plastic can leak through the junction or can get stuck in the junction, decompose, and the charred remains can then flow down and clog the nozzle orifice. I have experienced these problems even with the best hot end designs. With my 1-piece nozzle/heat-break design I have completely eliminated all internal “melt-zone” junctions and thus eliminated the possibility of leaking or clogging. With several hundred hours of printing and not a single leak or clog, the empirical results speak for themselves. In addition to the 1-piece design, I was meticulous about custom burnishing the internal pathway of the nozzle to avoid the possibility of the filament jamming. Filament jamming is the most significant problem associated with all-metal hot ends. While hot end “clogging” relates to the obstruction of the nozzle orifice, hot end “jamming” is associated with the forces involved in filament extrusion. In order to extrude filament successfully, the applied force of the extruder drive must be greater than the opposing force of friction. Friction occurs most prominently in the “transition-zone” of the hot end where the plastic is changing from solid, to rubbery, to liquid. The plastic remains solid until it is heated above its “Glass Transition Temperature” (Tg) at which point it is rubbery until it is heated above its “Melting Temperature” (Tm) and turns to liquid. In its “rubbery” state at temperatures between Tg and Tm, the plastic turns soft and expands to form a plug in the “transition-zone”. This plug of rubbery plastic is the most significant source of friction in the hot end and is the leading cause of hot end jams. The standard J-Head hot end design features a low friction PTFE liner that extends the full length of the “transition-zone” and greatly reduces the friction caused by this plug. However, all-metal hot ends do not have a PTFE lined “transition-zone” so friction becomes a significant issue especially when printing PLA. To overcome this problem I custom burnished the full length of the internal bore of the nozzle. The burnishing procedure polishes the internal pathway of the nozzle to a near mirror finish ensuring that it is smooth enough to eliminate jamming. Introducing the "melt-zone", "transition-zone", and thermistor position as fully customizable variables is what makes the Prometheus Hot End truly unique. The "melt-zone" and "transition-zone" length are two of the most significant design features of a hot end which govern the extrusion behavior while the position of the thermistor greatly influences the thermal control of the "melt-zone". In conventional hot ends these design features remain fixed and are optimized for a specific need, which allows for very little flexibility and experimentation. The Prometheus Hot End was designed specifically as a flexible platform that would enable RepRap developers to experiment with the effects of different "melt-zone", "transition-zone", and thermistor configurations on the extrusion behavior. The Prometheus Hot End was purposely designed so that these three parameters could be adjusted as easily as possible. The “melt-zone” can be lengthened simply by threading additional aluminium hex nuts against the heater block. As a result, the position of the thermistor in the “melt-zone” is user-customizable based on how you position the heater block and additional hex nuts on the nozzle. The “transition-zone” is easily set by increasing the distance between the heat sink and the heater block. The pictures below illustrate various "melt-zone", "transition-zone", and thermistor configurations that are possible with the Prometheus Hot End. To ensure reliable precise performance the Prometheus Hot End has been tested extensively. Prometheus has printed successfully for hundreds of hours in PLA, ABS, Polycarbonate, and Nylon on several Prusa I2 printers without any leaks, clogs, or jams. I have tested the Prometheus Hot End with various high stress printing scenarios without any issues: I have printed PLA at very low extrusion rates for long periods of time; I have printed Polycarbonate at 300C above a 140C heat bed in an enclosed print chamber; I have tested rapid successive retractions and 10+ hour long prints. I have also tested the Prometheus Hot End with the lowest quality PLA on the market. I had an old roll of neon green ESUN PLA that had been left in an uncontrolled environment throughout a very hot and humid summer in Toronto. 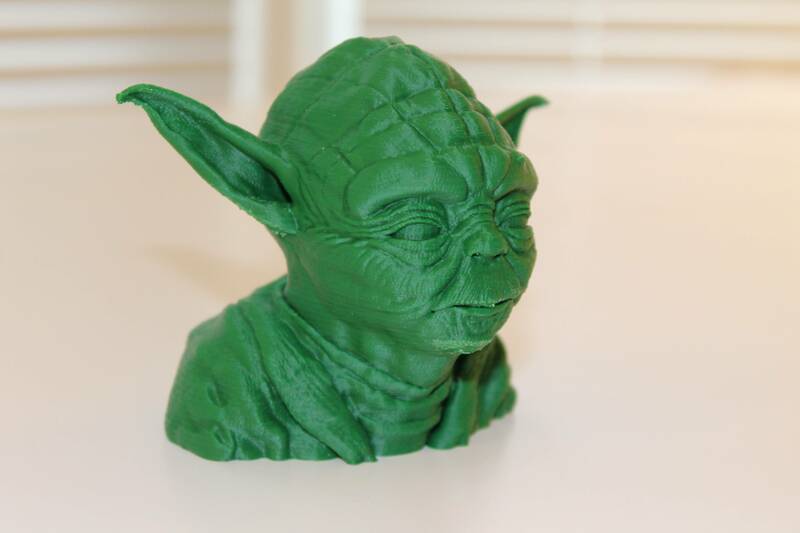 It was wavy and swollen yet I still managed to print a decent looking Yoda head and Bhudda bust at 100 microns without any issues! 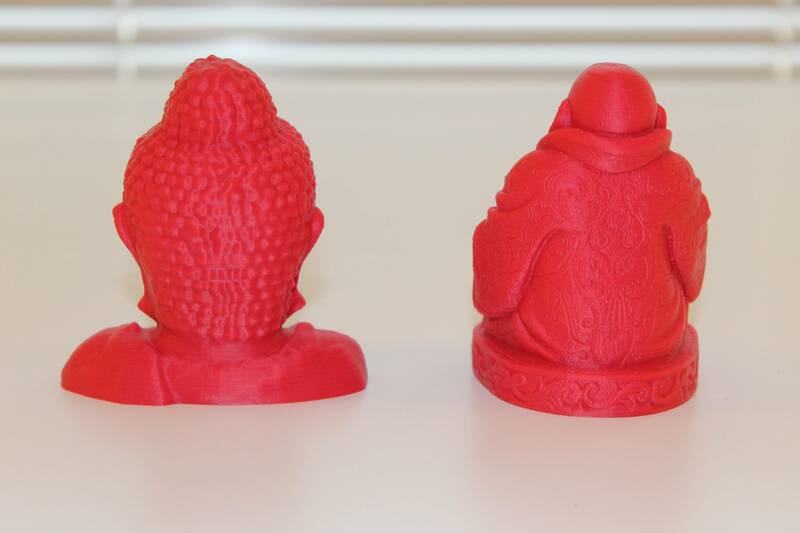 In addition to its admirable reliability, Prometheus has demonstrated great precision in the prints that it produces. I have managed to print down to 50 microns on my wobbly Prusa I2 printers! Most of my test objects were printed at 100 microns with amazing results that easily match objects I printed with my E3D hot end. YouTube: On my YouTube Channel you can watch several videos of the Prometheus Hot End printing PLA, ABS, Polycarbonate, and Nylon 618. Flickr: On my Flickr Photostream you can view over 300 pictures of objects that Prometheus has printed. 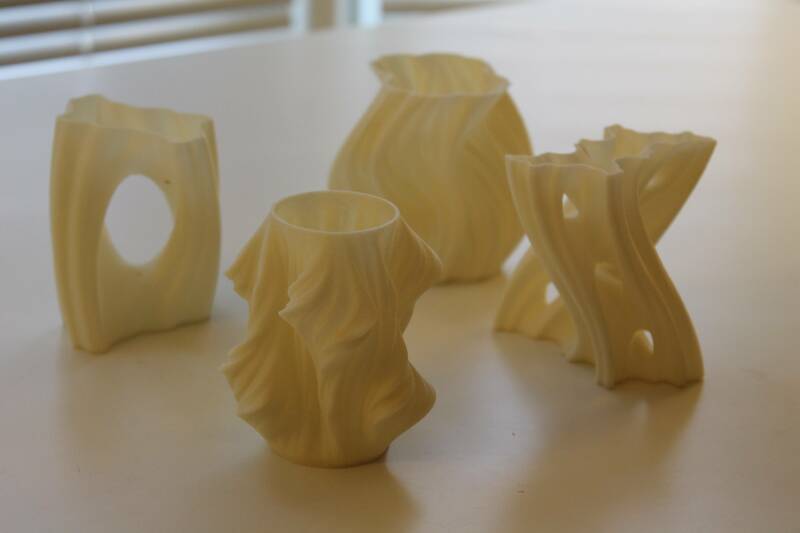 The pictures below are a few examples of objects I have printed with Prometheus. *Keep in mind that ALL of these objects were printed on my wobbly old Prusa I2 printers. If I can get these results on my old printers, just imagine how well Prometheus will perform on a rigid Prusa I3 or Mendel 90! Of course, I could not have created the Prometheus Hot End without the help the RepRap community. Browsing the RepRap wiki, reading RepRap forum threads (especially the E3D Hot End thread), and discussing various hot end designs with other forum members has taught me so much about the intricacies of hot end engineering. I hope that I can help refuel innovation within RepRap by making the technical drawings of the Prometheus Hot End available to everyone. I am releasing the Prometheus Hot End design under the Creative Commons Attribution-NonCommercial-ShareAlike 3.0 Unported License (CC BY-NC-SA 3.0). The drawings are available here on my Flickr Photostream so feel free to check them out! Besides that without a patent, you can't enforce the NC aspect of your license on a hardware design. The Creative Commons licenses are copyright licenses, which do not apply to hardware and mechanical designs. Still, this is a very cool design, and I like the adjustability and compactness of it. Is there a performance advantage to being able to adjust the zones? What zones settings did you do those test prints at? I like this design a little bit. The adjustable heater block is a nice feature. The stainless steel nozzle could lead to some problems, as it did with the Prusa hot end. The aluminum radiator looks like the aluhotend from JGR. I'm interested in where the ptfe liner stops and were the stainless steel starts. Do you use a mill bit to even the transition, or do you taper the ptfe? The main thing I have objection with is the allusion that this is a jam-proof hot end. There's always going to be jams somewhere. Not exactly sure yet as I am still sorting out some pricing details. I am trying to make this hot end as affordable as I reasonably can so that it can be accessible rather than a luxury. I will get back to you as soon as I have sorted this out. I understand why you brought this up and it is an important piece of information that needs to clearly understood. I am fully aware of the details and this is precisely why I was very explicit about what licence I am going to use for this design. There have been several in depth discussions on this that occurred a few months back and there was some dissonance with regards to restrictions on open source designs. If you read those threads you can find my posts and you will understand why I chose this licence. In brief, the NC clause does go against a part of the open source definition. I am aware of that and I am not trying to hide that. The NC clause is a way of me asking people to please respect my work by not exploiting it for their own monetary benefit. I do not plan on trying to enforce the NC restriction and if a copy shop started selling the Prometheus Hot End tomorrow there would be no way for me to stop them. I just hope that fellow RepRappers will respect my wishes and abide by the NC licence. I have spent an insane amount of time, money (lots of it) and effort on this project and selling the hot ends is the only way for me to make any of that back. If people by the Prometheus Hot End from me, they are helping account for the resources that I have already put into this project and also helping to fund my future development work. On the other hand, money eared by copy shops just goes to their owner's personal accounts. I stand behind the licence I chose and I think it is the safest way to develop "open source" hardware. "The drawings of the Prometheus Hot End are available for all at no cost as long as you do not use them for commercial purposes"
The "melt-zone", "transition-zone", and thermistor position are three key hot end features that are actually relatively unexplored (which is why I made this design!). These are the very basic theoretical assumptions, some of which have been vaguely empirically tested. For all of the test prints, I replicated the E3D hot end configuration of 14mm M-Z and 2-3mm T-Z just to see how the print quality compares. The SS Nozzle and the PTFE insert meet in the heat sink. The top of the SS Nozzle is tapered so that the filament passes smoothly from the PTFE into the SS nozzle. Depending on the length of the M-Z and T-Z the junction will be at different points in the heat sink though this is not a problem because the heat sink is uniformly cooled. In several hundred hours of extensive empirical testing, I have never experienced a jam. Of course my results may not reflect the performance of the Prometheus Hot End in every possible printer setup. I apreciate the need for protecting your intellectual property, but the heat sink looks to be about 25mm long. Is the transition in the middle, the top, or the bottom? I don't know if this can be considered an "All Metal Hot End." The PTFE liner is a critical part. I totally understand why you would want to use an -NC clause, and I hope you don't get crucified for it. It is most certainly your right to choose the license you feel is most appropriate. In this design, the PTFE liner is not subjected to high temperatures so it is not a problem. If you look at the first picture in my post, you will see that the 25mm cooling fan blows air over the entire heat sink along with the hex nut threaded at the bottom of the heat sink. Since the heat sink and hex nut are both aluminium, the heat that conducts from the heater block through the 1-piece SS nozzle to the heat sink is quickly dissipated throughout the heat sink which is cooled by the constant air flow produced by the fan. Consequently, the heat sink and the threaded hex nut are at temperatures only slightly above the room temperature and they constitute the "cold-zone" of the hot end. Since the junction between the PTFE liner and the top of the 1-piece nozzle is always within the heat sink, the PTFE liner remains in the "cold-zone" of the hot end and never experiences high temperatures. And of course the "melt-zone" is the remaining heated portion of the hot end. Yeah, I totally agree with Markus' views on this. I first read Markus' posts on NC licenses about 6 months ago and that is when I decided that they were the most appropriate license to use in this project. Unfortunately some people cannot accept the use of any NC clause whatsoever within RepRap. I hope people reading this thread realize that I am not trying to be selfish or anything like that, I am just trying to be as "open source" (not Open Source by definition) as possible while still protecting my work from exploitation. I overlooked this before so I should respond to it now. The reason the Prusa MKI has so many issues was not actually a particular result of the SS nozzle, but rather a consequence of the completely uncontrolled "transition-zone". If you look at the Prusa MKI design, you will see that there is no heat sink to dissipate the heat that creeps up the SS nozzle from the heater block. As a result, heat travels up the nozzle creating an incredibly long TZ. This elongated TZ increases the friction in the hot end to a point where the filament jams. The TZ must be kept relatively short in all-metal hot ends to prevent jamming. In my design, the TZ is controlled by the actively cooled heat sink and the length can even be customized! My design does not suffer from the same defects of the Prusa MKI and the empirical printing results illustrate its reliability. I really want to know what you guys think about this and get your opinion on the design decisions that I made. Your new business is going to receive a lot of reviews. Employ some one with a degree in English, is a native English speaker, and has experience editing advertising copy. I wouldn't call this an open source project unless you are 100% sure that it is. I don't know what the rules are for using the RepRap logo, I haven't read the CC's, you should verify. Because you use a Teflon liner, I wouldn't claim an all metal hot end, you will confuse the consumer. You should change the title of your thread to reflect this. Durable, actively cooled, all-metal construction for high-temperature extrusion up to 300C (limited by thermistor reading). I wouldn't clam that the upper temperature range is limited by the thermistor. Some one might modify your design, and mount a heater cartridge, with a thermal couple thinking your hot end can handle high heat. Set a safe maximum upper temperature limit such that the device never fails catastrophically. Have you tested the hot end without a fan. 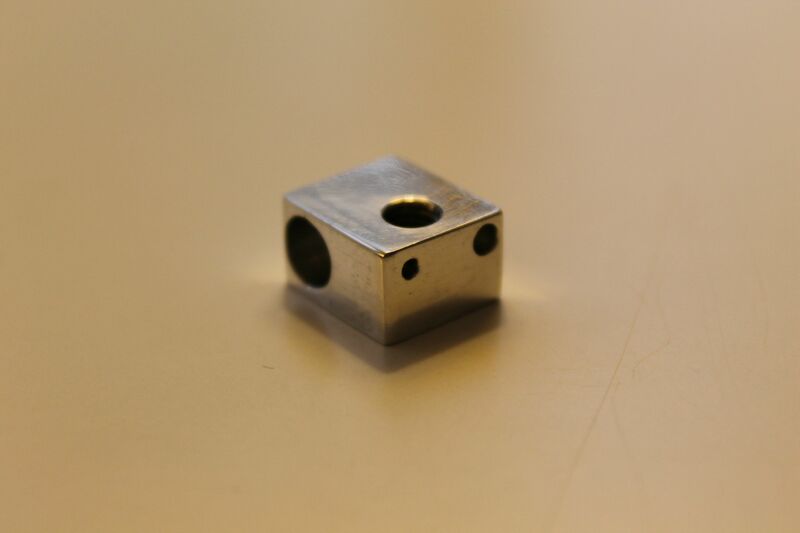 Some clients will be interested if the hot end can operate without being actively cooled, and the effects of the print quality, and the potential for jamming. Your using a Teflon liner so it might work with out the fan. Precision CNC-machined parts featuring an internally burnished 1-Piece Stainless Steel Nozzle. I custom burnished the full length of the internal bore of the nozzle. Cut the nozzle in half to demonstrate to your potential clients the quality of the surface finish. I think this is a salable feature to show case. Are you removing (honing) or reshaping (burnishing) the metal to achieve a near mirror finish on the barrel? Burnishing: reshapes the peaks of the tooling marks into the trough. Polishing: reshapes or removes material, typically the finish of the surface is dictated by the size of the medium. Honing: removes material, and the finish of the surface is dictated by the size of the medium. Lapping: removes material, and the finish of the surface is dictated by the size of the medium. The burnishing procedure polishes the internal pathway of the nozzle to a near mirror finish ensuring that it is smooth enough to eliminate jamming. I wouldn't make a subjective claim, quantify the allowable range of the surface finish on the blueprints. As a result, the position of the thermistor in the “melt-zone” is user-customizable based on how you position the heater block and additional hex nuts on the nozzle. The thermistor position is dependent upon the position of the heater block, and the hex nuts? Can you support this statement? Some one might argue that the extrudate behavior is dictated by the orifice land length, orifice diameter, temperature, and extrusion rate. The “melt-zone” can be lengthened simply by threading additional aluminium hex nuts against the heater block. The “transition-zone” is easily set by increasing the distance between the heat sink and the heater block. though this is not a problem because the heat sink is uniformly cooled. I wouldn't argue that the “melt-zone” or “transition-zone” can't be modified. But after conducting 1000's of experiments, and discovering that the results of my experiments don't always match my expectations, I'm a little skeptical. My guess is that regardless of the filament material, your experiments will always end up with the same conclusion. For best performance, the length of the glass transition zone will always be minimized. I don't think (but don't know) that there is an example of a longer glass transition zone being an advantage. Can you provide empirical data to support a claim that a longer glass transition zone is preferable. If not, then I would eliminate the adjustable thermal break, and simplify the design. After 100's of hours of printing, share a few stories of how adjusting the thermal break, melt zone, and heat sink improved the print. Provide before and after pictures/video. Prometheus has printed successfully for hundreds of hours in PLA, ABS, Polycarbonate, and Nylon on several Prusa I2 printers without any leaks, clogs, or jams. Are you implying that the client can't adjust the glass, and melt transition-zones to cause the filament to jam? If it's not possible to recreate a jam, what do you attribute this too, this is a sell point. From what I have read, the filament jams after a period of time of inactivity. Given enough time the heat migrates up the filament, lengthening the glass transition zone creating a larger plug. Does your design over come all scenarios of jamming, have you tested this. Your videos are not in focus, it's difficult to see your hot end, don't advertise with out of focus images. Mount the camera to the carriage that the hot end is mounted to so the hot end stays in focus. You are selling the hot end, not the printer, or the printed object. I would also like to see an in focus close up video of only the extrudate exiting the nozzle, (stationary, don't print an object) with different configurations of the hot end. Demonstrate and document with a video that adjusting the different parameters has an effect on the extrudate. HTH, and good luck with your Indiegogo campaign. Edited 1 time(s). Last edit at 03/06/2014 08:27AM by A2. I can respect that and agree that others within the community are taking a short view of any license other than fully open. I would though point out that protecting your investment and opening it up fully are not mutually exclusive. Fully open means more smart people may want to contribute particularly users with manufacturing expertise/capability. Plenty of folks have sustainable businesses and fully open the project. Prusa, Johnny RAMPS/RAMbO, Brian JHead and Maxbots. All of those designs are available from others but the developers seem to be more or less working at capacity. I think in the end I think an NC license is more about making the developer feel protected however false the reality may be. There is nothing you can do to protect the design. You could trademark Prometheus Hot End and protect that but your basic mechanical concept is not going to be protected by an NC or any sort of user license. I think the concept of adjustability for various conditions and materials is the key and rather than having others help build on your design will only cause them to fork your design and not fully allow you to reap one of the great benefits of open hardware. I like it. I'll get one when you start shipping. First of all, thank you very much for taking the time to write this critique. I will try to answer every one of your statements. Maybe not all in this one post, but I will work my way through them. As we discussed above, it is not Open Source strictly speaking by definition due to the NC clause. However, I think not calling it an open source project would confuse people even more as all the drawings are available for all and for any use (with the exception of commercial uses). Many developers within RepRap call their work open source even when they use the same license as I am using (CC BY-NC-SA). 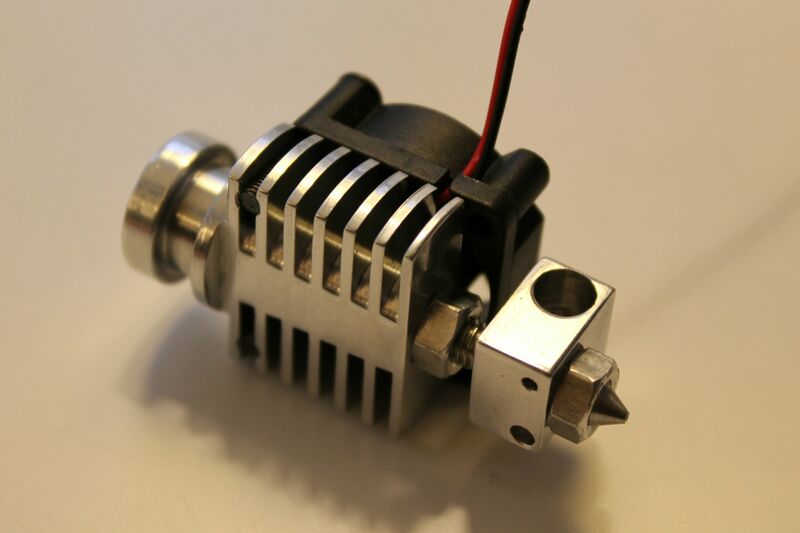 Examples include the E3D Hot End, Bulldog Extruder, among many many others. I think it is safe to call it open source so long as I clearly indicate the license that I am using (everyone else does this). My hot end design still classifies as an "all-metal hot end" because the PTFE liner in in the "cold-zone" of the hot end. Many all metal hot end designs have PTFE in the "cold-zone". All-metal hot ends are designs that do not feature PTFE in the "melt-zone" or "transition-zone". If having a plastic in the "cold-zone" disqualified a hot end design from being categorized as "all-metal" then there would be no such thing as an "all-metal hot end" as all hot ends mount to a plastic carriage and some (namely the E3D) also have plastic fan shrouds. If the Prometheus Hot End were to overheat, it would melt through the ABS carriage long before the PTFE insert melted. I think it would confuse the customer a lot more if I said that it wasn't an all-metal hot end. It meets all of the high temperature requirements so this will not be a problem. This hot end cannot be used without a fan. This would lead to the heat sink overheating and would result in an uncontrolled "transition-zone" which would lead to jamming. The Prometheus Hot End is designed to be actively cooled. Unfortunately, I do not have the tools required for this. Believe it or not, I do not have access to a machine shop. All my prototyping is done straight from the manufacturer, which is why this project has been so expensive for me. I wish I had these tools but unfortunately they are way out of my budget. If I am successful enough with the Indiegogo campaign I will be able to start investing in some small hobby CNC machines. I will answer the remaining statements shortly, I just gotta get some lunch! I believe the polishing process that my manufacturer uses is actually a combination of honing and burnishing. The hole is drilled, then abrasively honed and burnished. Unfortunately, precise objective surface finish data is not really possible. I just ask my manufacturer to polish the internal pathway in an economical way and the honing/burnishing process is what they came up with. If I got into specifics with requirements on exact surface texture the cost would increase significantly. The manufacturing cost are already quite high and I want to be able to offer this hot end at an affordable price. Yes, of course the parameters you listed also influence the extrudate behaviour, but the MZ, TZ and Thermistor position are still some of the most significant parameters which affect the properties of extrusion. The MZ, TZ and therm position are parameters that have not been significantly explored due to the fixed designs of conventional hot ends (which is why I came up with this design). There is much more to it but we really need to start experimenting before we can make any more than theoretical assumptions. I agree that for performance, it is best to minimize the TZ. Having a variable TZ is a consequence of the modular design and I think it will be useful for us to start experimenting with the TZ length "point of failure" (when the filament jams) with various plastics. The only advantage I stated with regards to a longer TZ is that there is less heat loss through the nozzle to the heat sink (higher heater efficiency). If I was to eliminate the adjustable thermal break, It would not be possible to adjust the MZ length or therm position and this hot end would be like every other all metal hot end on the market. I am trying to push some boundaries with this design rather than just recreate the E3D hot end. As for the testing you are referring to, what I discussed in the "Testing" section of my post is the only testing I have done. It is really not possible for me to test every TZ, MZ and therm position configuration possible and provide videos and pictures of every modification to my parameters. Believe it or not, this is actually an incredible amount of work and I am just a 1-man operation My idea was to focus on getting this hot end design into the wild so that this kind of testing can be crowdsourced throughout the RepRap community. I am not implying that the TZ cannot be lengthened to a point of failure where the filament jams. Of course this is possible, I just haven't had the opportunity to test it. In my testing (all of which with about 16mm MZ and 2-3mm TZ) I did not experience jamming with my specific printer set up. As I mentioned earlier, this does not guarantee that the hot end will never jam. I was trying to state my empirical results as clearly as possible. My pictures are taken with a DSLR camera and I tried to make sure they are clear (I think most of them look very clear). As for the videos, I do not have a camcorder so I had to use my DSLR camera which only takes 720P video and does not focus properly during videotaping Not to mention the sound is awful. There is also no way I can mount the camera to the carriage as it is quite large and would get in the way of the print moves. Given the tools I have, I really tried my best with the pictures and videos. 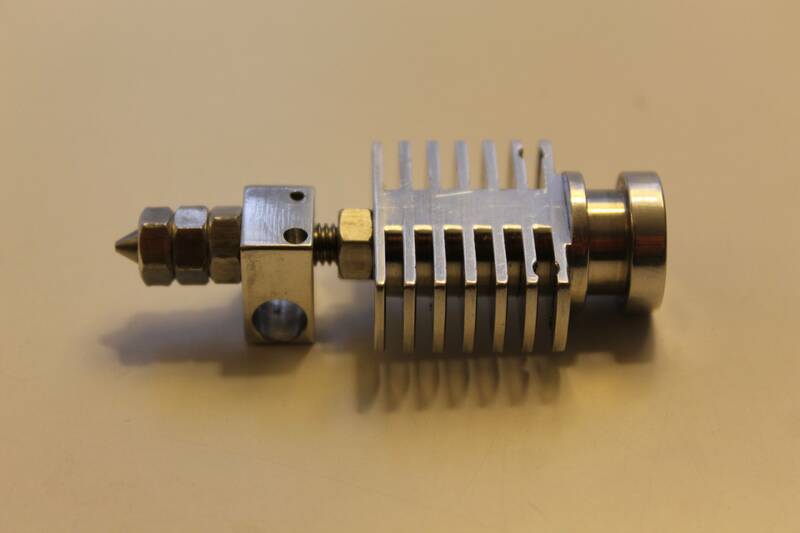 In fact, if you look at various hardware projects like the E3D hot end, PICO hot end, Bulldog Extruder, etc. you will see that I provided MUCH more extensive empirical results ( about 300 pics and 10 videos) than any of these projects. The PICO received almost 60 thousand on Kickstarter and they did not even show a single video of it printing! I am trying to be as open about this project as possible but please understand that documenting testing is A LOT of work. I understand what you are saying. Initially I am going to retain the NC license. I will not have a problem keeping up the demand as I am working with a large scale manufacturer. Initially I will need all of the orders I can get. Once the finances have evened themselves out, I may consider removing the NC clause. I am not sure about this yet though. I will think on it. I forgot to mention that I was also very careful about designing the Orifice length and Orifice landing diameter of the nozzle. If you look at the technical drawings, I designed the orifice length to be 1mm (for a 0.4mm diameter orifice) as this has been determined through Sanjay's work (and the work of others) to be the approximate optimal orifice length for a 0.4mm nozzle. Like many others, I have observed that this orifice length minimizes the ooze while not increasing the extrusion force significantly. As for the orifice landing diameter. My decision to have a 1.2mm landing is also largely based off the empirical results of the E3D hot end. This 1.2mm landing diameter greatly helps ensure that the top infill layers are smooth and uniform especially with very wide infill traces. I think your hotend is very interesting. Not going to criticize anything, I see others do that enough already so I hope you take it as constructive criticism and maybe one day I'll be able to order your hotend! This hot end should not have a problem printing 1.75mm PLA. Unfortunately, I will only be offering 0.4mm nozzles in the beginning so I hope that is ok for you. I am still working out the cost details but this is not going to be an overpriced hot end. For now I am going to leave this thread here, since this thread is asking for advice and critiques on a product that hasn't yet been placed on a crowd funding site. A more appropriate place may be the Plastic Extruder Working Group, but most people seem to use that forum for discussing filament extruders (creating filament) rather than printer extruders. Once this product launches on Indigogo, this thread can be moved there and the original post updated with the Indigogo link. I don't understand why someone would report that to the mods. Take a look at the E3D hot end thread, it has been in the General section for many many months and it is almost identical to mine. In his thread, Sanjay actually had much more focus on the marketing of his hot end design. Look at the title: "Update on the E3D All Metal Hotend (Now finally shipping!) smileys with beer [Lots of pictures]" Take a look at Sanjay's first post and then compare it to mine. I am trying to focus on the technical facets of my hot end design to start discussions that will likely help a lot of people understand the intricacies of hot end design. The reason I did not post it under "Plastic Extruder Working Group" is because nobody goes there looking for new hot end designs! The fact is that there is no specific subjection dedicated to Hot Ends. If there was, the E3D thread would have been moved there long ago. Also, I thought this would be of interest to everyone in the community so General would be the appropriate section. Yes, of course marketing is a part of it. I need people to see this and get excited about it and everyone checks out the General section. I focus all of my resources on development so I cannot afford to spend any on marketing. My only connection to the user base is through the RepRap forums. Is it so bad for me to try any bring attention to my development work? I have spent so much time, money and effort on this project and the only way I will be able to continue working within RepRap at all is if I can make back some of my initial investment through a successful crowdfunding campaign. Aren't we supposed to help each other out around here? I don't think there is any reason for my thread to be moved considering that Sanjay did not encounter this problem with his thread. 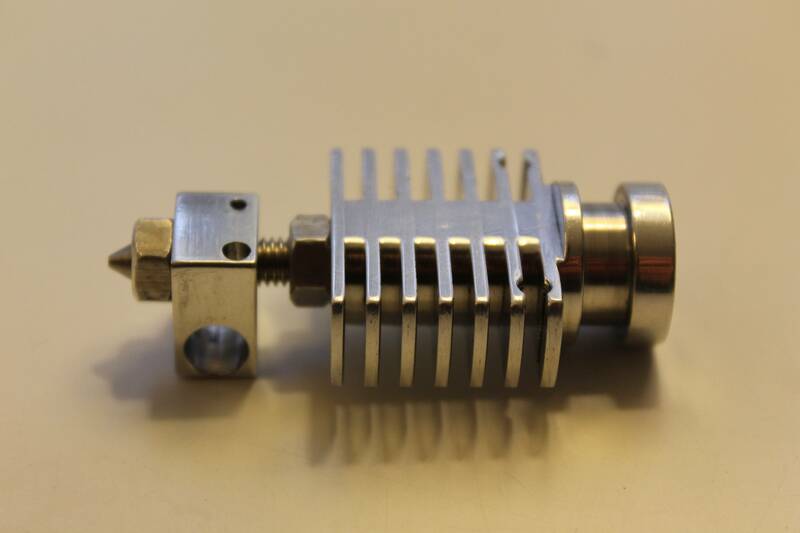 Also, look at the other threads about the Prusanozzle and other hot end designs in the General section. I don't see why I should be discriminated against. Also, why wouldn't this anonymous person post their grievances on this thread so that everyone can see? I can see why it was reported and depending on how it goes I can see it being moved to the crowd finding section. As for the other threads you mention they were there before the crowdfunding section existed and before the sticky rules were posted in the general section to try and stop ads from being posted here. But when I first read this thread I did not get the feeling it was an ad as much as an announcement to tell people about your design since you have already released your drawings. On a side note about the license. I truly believe an NC license hurts your sales. If you look at RAMPS vs. Gen7 you will notice the one with the NC gets very little attention and you do not find it being recommended for any reason other than you can make it yourself. I can't recall ever reading "you should buy a gen7 board" only "you could make a gen7 board". This is nothing against gen7 it actually has some advantages over other electronics like being 20mhz not 16mhz just that the license limits its exposure and popularity. Back to the hotend. 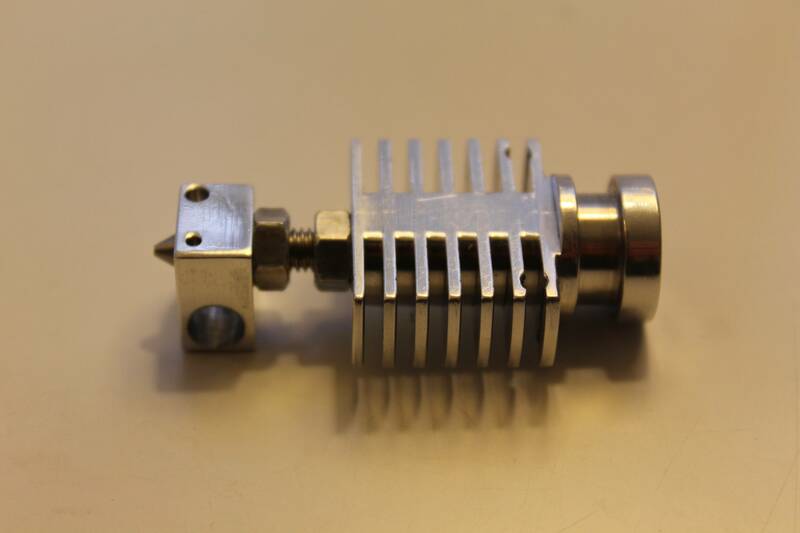 It looks good and I like that it is a hybrid hotend. Whenever I hear "all metal" I cringe a little knowing all the issues that most of them have. I think calling it a hybrid would benefit you by getting people that want a high temp hotend but have been scared away from all metal. As well as being a little more accurate since it is does have plastic inside the metal portion. What cfm fan does it use and is it the minimum cfm you found worked? Or is it possible to use even less airflow say from a remote air pump and tubing running to it? Also when you say it is adjustable do you mean you can change it at will or just that during initial set up you can make it one way or another? I ask because I can see it requiring a new liner for each change in length and I can see it being hard to take apart on a machine. Edited 1 time(s). Last edit at 03/06/2014 10:21PM by Sublime. Thanks if it's going to be 0.4mm that might be okay. I currently print at 0.3mm layer height, so I guess with a 0.4mm nozzle that should theoretically still be possible. Curious to see what it's going to be. Keep us updated! From what I can see, you are using standard nut sizes. How about using half nuts for finer adjustability? Or are they too costly? Other than that, I love how short your hot end can be configured to be as one thing that has always bugged me about the E3D is its sheer length. In most printers, this shouldn't matter, but when designing something to be as compact as possible, the size of components suddenly does matter a lot. Like Ohmarinus, I really hope for reasonable shipping costs to Europe (or maybe partnerships with local sellers / RepRapDiscount?). I am not sure if the relative success of RAMPS over Gen7 is due to the license. I don't actually know enough about Gen7 to compare them because I have always used RAMPS. I think the wide popularity of the RAMPS board may be due to the fact that it uses the Arduino Mega which many people are already familiar with. Also, if you look at the hot end market the E3D hot end is by far the most popular "high temperature hot end" and it is under an NC license. BTW I am not comparing it to standard PTFE lined hot ends because in that field the J Head is by far the most popular. I think using an NC license would definitely limit sales if you could not keep up with demand. Since Brian is already operating at max capacity, it makes sense for him to not use an NC license for the J Head. I really don't think this design will be so popular that I will not be able to meet the demand, though this would be a fantastic problem to have If that were to happen I would definitely remove the NC clause from the license. There are also the QC issues relating to having a product manufactured by different standards. You can see this problem with the J Heads produced by copy shops as they are often of poor quality. This would especially be an issue with my design since the internal polishing of the SS nozzle is integral to the reliability of the design as is an added cost that many manufacturers would prefer not to take on. Having lower quality products carrying the same brand name ultimately has negative effect on the perception of the product by the user base. Maybe the solution is to have "approved manufacturers" assigned by the developer of a design. The "approved manufacturers" can sell the product with the developer's endorsement and in exchange they provide the developer with a small percentage of their profits. Has anyone done this before? Do you think it would work? My hot end design still classifies as an "all-metal hot end" because the PTFE liner in in the "cold-zone" of the hot end. Many all metal hot end designs have PTFE in the "cold-zone". All-metal hot ends are designs that do not feature PTFE in the "melt-zone" or "transition-zone". The key here is that in PTFE lined hot ends, the friction caused by the plug that forms in the "transition-zone" is negated by the low friction coefficient of PTFE. Like all other all metal designs, my hot end does not have a PTFE liner in the "transition-zone" so basically my hot end is an "all metal hot end" and would theoretically suffer from the same issues as all other all metal hot ends. To overcome these issues, I had the length of the SS nozzle polished to reduce the friction cause by the "transition-zone" plug and thus decrease the possibility of the hot end jamming. Of course, even with the polishing procedure, this nozzle may not meet the performance of a J Head for PLA printing, but it will be on par with the E3D hot end performance with PLA. The truth is that all metal designs will likely never meet the performance of PTFE lined designs when printing PLA. In my testing I did not have issues with jamming so I think the polishing procedure is more than enough to satisfy PLA printing requirements. However, like all high temperature hot ends, the purpose of removing the PTFE liner from the "transition-zone" is to print high temperature plastics like PC and Nylon, which this design is perfectly capable of. So in short, I tried to make this design an all-in-one solution, but if you ONLY print PLA, then you may just want to stick with your J Head UNLESS you want to try out the cool new features of this design! As for the fan, I use a 25mm x 10mm 4CFM cooling fan. You may be able to get a way with lower air flow but I am using 4CFM fan because it provides enough cooling in all printing scenarios (no big problems printing over a hot bed in a heated chamber). You could use a remote pump if it provided enough air flow and the tubing was directed at the base of the heat sink. I have not tested this though so you would have to experiment with the specific air pump that you plan on using. As for the adjustable MZ and TZ and heater block position. These are things you set when you assemble your hot end. Adjusting these features will require about as much work as changing the nozzle on your E3D hot end as it involves disassembling parts of the hot end. You will require a different length of PTFE liner for different MZ and TZ settings but I will provide more than enough tubing so this will not be an issue. It has been determined that this thread will remain in the General section of the forum. To prevent this from turning into a crowdfunding campaign advertisement, I ask that we keep the discussion related to the technical facets of the hot end design (I guess it is also ok for us to continue discussing the NC license as well). If you have any questions relating to the upcoming crowdfunding campaign you can PM me. When I do go live with my Indiegogo campaign I will let you guys know and I will start a new thread in the appropriate crowdfunding section so that this thread will not be derailed. I really appreciate everyone's input so far and I encourage you to let me know what you think of this design! Yeah, the reason I chose a 0.4mm nozzle is because I think it provides the optimal balance of precision. You can print down to about 50 microns (or likely lower depending on your printer) and up to about 400 micron layers with precise perimeters. With regards to the nut sizes, I totally understand what you are saying. This was one of the dilemmas that I had in the design process. I really wanted to use half nuts but I decided on standard nuts due to availability. Since these hex nuts need to be very thermally conductive, aluminium was the way to go. The problem is that aluminium hardware is really difficult to find in Canada. I could not find a wholesale supplier of metric aluminium hex nuts in North America so I am going to have to order these from China. Aluminium half hex nuts are very rare and I didn't want to be stuck with this deficiency as a bottleneck in the production process. I considered using copper as the higher thermal conductivity would be beneficial but copper corrodes quickly and I did not want to have to deal with this problem. So in the end standard aluminium metric hex nut are what I am using. The nut below the heat sink is a necessary part of the design that I don't really like. The nut is necessary to secure the SS nozzle to the heat sink but impedes the cooling of the "cold-side". The nut is aluminium so it transfers the heat to the heat sink very well and it does not get much hotter than the heat sink. I tried to compensate for the cooling inefficiency by designing the cooling fan to blow directly over the nut. As you pointed out, the thermal gradient is more noticeable at higher temperatures. For example, while printing Polycarbonate at 300C over a 140C bed in an enclosed chamber the nut at the bottom of the heat sink gets quite hot. I can definitely still touch it but it is hotter than I would like. However, so far this has not been a problem because the temperature of the nut has remained below the Tg of the plastic. Since Polycarbonate has a Tg of about 150C printing in these conditions is not an issue. However, if someone were to print PLA at 300C the hot end would certainly jam. Considering the temperature that people use for each plastic, this minor cooling inefficiency should not become an issue as the temperature of this nut will remain above the Tg of the plastic. I am glad that you like the compact design! Shrinking design footprint was something that I was striving for from the start. When I first got my E3D hot end, one thing I found annoying was that it did not fit under my Kuehling Prusa carriage. I was careful to design this hot end to fit perfectly under the standard carriage I also gained about 20mm (more or less depending on the TZ and MZ lengths) with this design which was a big deal on my Prusa I2s that only have 80mm of print height! Edited 1 time(s). Last edit at 03/07/2014 07:43PM by RP Iron Man. I hope this thread is not going to be another drawn out E3D affair.. While the E3D hot end thread did go off topic many times and was the battleground of some petty arguments there were still a lot of interesting ideas that were discussed in that thread. I hoping to recreate the interesting discussion WITHOUT the off topic posts and petty arguments. I think your last post constitutes an "off-topic post" No more of that! The nut below the heat sink is a necessary part of the design that I don't really like. 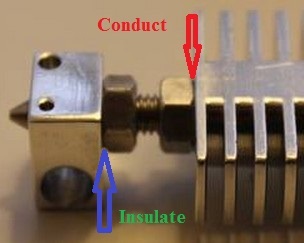 The nut is necessary to secure the SS nozzle to the heat sink but impedes the cooling of the "cold-side". This doesn't make sense to me, have you conducted a thermal analysis of the heat flux from the barrel, into the nut, to the heat sink? by pulling heat away from the SS barrel, that's what a heat sink does. heat source and the edges of the heat sink. and the first aluminum nut to reduce the heat flow up the barrel. I would also encase all of the SS barrel with aluminum nuts (a longer heat sink would be preferable) to help cool the barrel. But if you have data that indicates otherwise?, then place an insulative washer between the heat sink and aluminum nut. I would back your claim that the heat transfer from the aluminum nut into the heat sink is undesirable with some data. I could be wrong, and your experience with your hot end design maybe unique. Heat transfer analysis is best validated with an empirical model. and an appropriately sized thermally conductive mass, and fins works best to diffuse heat away from the source. There are other approaches that one can take, but this is probably the most common. Taken from my thermal properties database are materials that you can test for use as insulative washers. Teflon, not reinforced, but could creep. Phenolic resin, pressed, types 40, 50. Teflon, reinforced to reduce creep. I think a mica washer would be the best choice, but it's not durable, i.e. it's very easy to break. I would create a sandwich with glass washers on the outside, and with a mica washer in the middle. A material's thermal effusivity is a measure of its ability to exchange thermal energy with its surroundings. Edited 2 time(s). Last edit at 03/08/2014 01:18AM by A2. Thermal analysis is not very accurate for these types of complex scenarios. I think we discussed this in the PICO hot end thread. There are too many factors (ie. thermal radiation, air flow turbulence, etc..) that are not taken into account with computer modeling. I never bothered to go through the trouble of thermal modeling this design because in this case empirical testing was much easier and more than adequate. The aluminium nut has much less mass and surface area than is ideal for the base of the heat sink so there is a more significant thermal gradient within the "cold-zone" than I would like (ie. the bottom of the heat sink is hotter than I would like it to be). 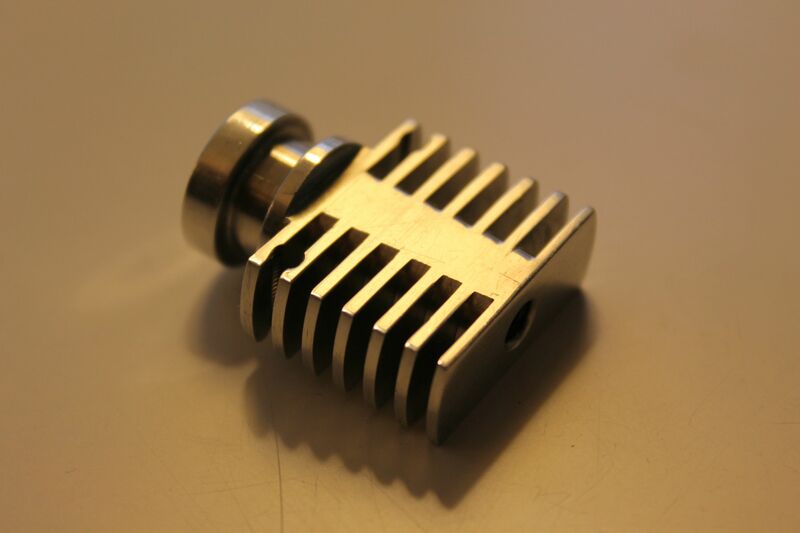 Yes, the aluminium nut together with the heat sink is the "cold-zone" of this hot end. It is meant to diffuse heat that is transferred through the SS nozzle heat break. Ideally, the temperature of the "cold-zone" would be nearly uniform throughout and would be at ambient temperature. Of course in reality this is not possible as it is limited by the thermal conductivity, heat capacity,and mass and surface area of the "cold-zone" (aluminium in this case) and the air flow of the cooling fan. I agree with this, the reason I said that the aluminium hex nut at the base of the heat sink impedes cooling of the "cold-zone" is because it does not have as much mass or surface area as the rest of the heat sink. Are you suggesting that I place an insulating washer in the [TZ] "transition-zone" (the uncovered threaded portion of the SS nozzle in the picture)? This would actually increase heat transfer to the [CZ] "cold-zone" because any material I would use would have higher thermal conductivity than air (0.024). Air is a great insulator. I am not sure what you mean by this. If you look at the picture of the hot end, the only section of the SS nozzle uncovered is the TZ because I am trying to minimize heat transfer through the thermal break to the CZ. All other sections of the SS nozzle are encased in aluminum both for the MZ ("melt-zone") and the CZ. Oops, I didn't see the annotated picture that you included in your post. Ok, in your diagram, BOTH of the arrows should say CONDUCT. The hex nut in contact with the heat sink needs to dissipate heat that is transferred through the SS nozzle and the hex nut in contact with the heater block is actually a part of the MZ ("melt-zone") so that needs to conduct heat as well. The length of uncovered SS nozzle is the TZ and is INSULATING the MZ from the CZ.